I wanted to give you an update since last week on the progress of our greens recovery. Our greens have been responding to the cooler night temperatures and the lower humidity of the last few days. We will begun mowing our greens daily except for a few of the weaker greens. Greens 3, 6, 8 9, and 11 are a little further behind the others in their recovery but they are improving. We continue to evaluate our height of cut as our turf strengthens and will begin the process of bringing height down as we think the turf can handle the lowered height. Light topdressing will begin next week on the healthiest greens with some hand topdressing of our weakest greens in spots. We will use a combination of seeding and sod plugs from our bentgrass nursery to improve the damaged spots on our greens and collars. Topdressing will be utilized to help improve ball roll and provide protection for the plants trying to fill back into the weakened areas. As the greens continue to strengthen, we will begin to utilize growth regulator products which will improve ball roll and start the process of antagonizing the poa annua and slowly reducing its dominance of our green’s turf. The seeding process will include using our small walk behind slit seeder on most of our collar areas to improve the overall bentgrass population. This is a normal late summer/fall maintenance practice. Smaller areas will be scratched with a weed weasel as seen on TV which lightly scratches the surface providing for a safe haven for the seed. We will also utilize our Toro walking aerator with the small rescue tines which indent slightly into the green surface providing a small protective reservoir for seed to germinate. Seeding can be problematic because of the maintenance practices that take place on a daily basis and the daily golf play. Young plants have little if any root systems and can be pulled out of the ground by a mower. They are also very sensitive to moisture stress. As our greens continue to improve, we will be reducing moisture to improve the health of our greens and improve ball roll. The surface of the greens are naturally drier in the late summer and early fall because of lower humidity and the mature plants are able to survive longer periods without moisture because of the cooler temperatures. This helps to firm up green surfaces but it does place the new seedling in a drought stress situation. Our solution is to reduce overhead watering and increase light frequent hose syringing to keep the soil slightly moist on top for the seedling but not too wet so that we can improve playability. The seed will begin germination and growing after 7-10 days of being sown and will mature over the rest of the fall season. Golf Course Industry Magazine has recognized our Golf Maintenance blog as "Blog of the Month" for August. The long range tee box has not been in very good shape since about the first of July. We were working hard at keeping divots filled with sand and seed and keeping our nutrient levels elevated to improve recovery. Here is a summation of how the tee went from really good to not very good over a few months time. believe that winter kill played a major part in the lack of bermuda grass this season. Due to the shade issues and weakened bermuda grass, the tee is basically half warm season and half cool season. of the tee for practice during the Inivitational but that was about it. Crabgrass has also become a problem with this tee. Continous over seeding of divots during the season does not allow us to pre-emerge the tee. We use some post emergent sprays in the summer once the crabgrass has germinated but with the lack of bermuda grass cover and the already damaged tee, we were very conservative in our application of these products due to high temperatures in June. We did make a couple of applications during some cooler weather but the material did not take out the crabgrass completely. What are we facing now. Well, a tee that is pretty ugly and not in very good shape going into late summer. 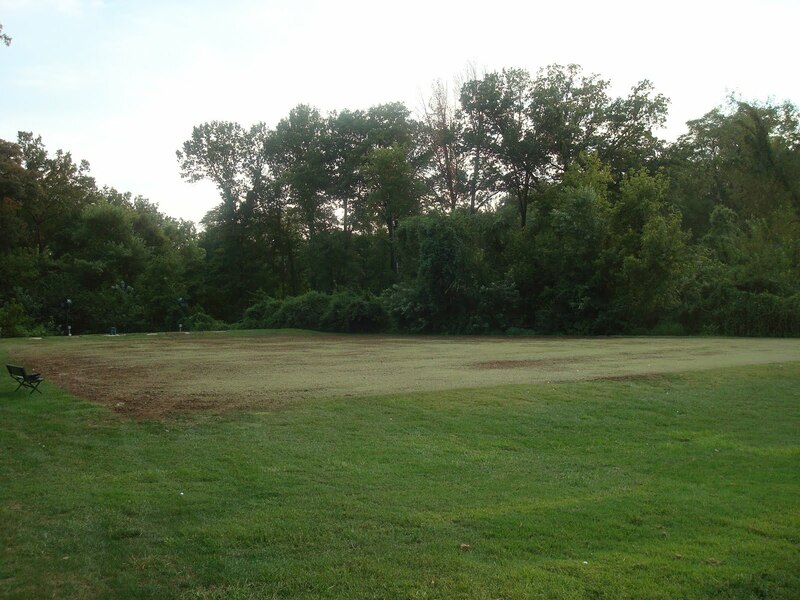 We were able to spray a product which completely wiped out the crabgrass earlier last week. Bermuda only covers about 60% of the tee and the rest is pretty much void of any substantial turf cover. We decided to drill the tee with rye in a couple of directions plus broadcasted some additional seed with a spreader, fertilized the turf heavily and will be watering fairly regularly to encourage the bermuda to expand and germinate the rye grass.The ryegrass should take off over the next few weeks as will the bermuda. I would expect the tee to be in good condition in the next 2-3 weeks. As you are aware, the range has been sold and when the sale goes through, we will not have to worry about this tee again but if by chance the sale is not complete, we will probably have to consider some tree removal(this will be up to the green committee to decide) in this area to provide adequate sunlight for whatever turf covers the surface. 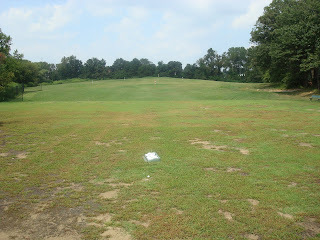 From the back of the tee toward the front taken last week before we drilled in the seed and sprayed out the crabgrass. The view from the front after drilling in the seed. We will be watering this tee heavily over the next few days to keep the seed moist and encourage the bermuda to regenerate and begin to spread. We have had great success with the zoysia short range tee this season. It will be available for practicing ever day of the week. The back collar of #9 green has been very problematic over the years for our maintenance staff to keep in good condition throughout the season. The entrance to the bunkers for our bunker rake is at the bottom of the bunker nearest to the green. The perimeter mower with large heavy reels drives around the edge of the bunker and onto the collar at times because there is not enough space for the equipment to pass through. Riding greens mowers which are used at various times of the season for mowing, grooming and rolling greens cannot make a turn without first turning onto the collar, driving off to the side of the bunker over a narrow strip of zoysia and back in through the same spot creating serious compaction issues. Our new irrigation works very well but does not apply the amount of water in this narrow area to keep the bentgrass collar alive and looking good for the complete season. To solve this problem and clean up this ugly mess, the staff removed the damaged bentgrass and replaced it with zoysia to expand the area between the bunkers and the new collar we will establish. Our collar widths average about 30" in width so the back of the green will be 30" shorter. The staff removed the old sod, smoothed out the area, cut new sod off of our zoysia nursery and laid it all back in place. It should allow for an improved back bentgrass collar and allow our equipment operators more room to maneuver equipment. Asst. Skip cutting off the sod and Arian picking it up. Arian and Tom Mueller removing the sod. A bag of starter fertilizer waiting to be applied to the soil surface to help give the new turf some energy and increase rooting capability. The new intermediate cut almost complete. The work completed. The new sod was laid from one side of the green to the other. Completed the last 4 fairways on Monday. Still need to do the nursery but that will not effect play. Speaking of the nursery. Last year's zoysia sod that was removed has filled back in completely. I would think the area will be able to be used again after next season. Most sod farms return their removed areas back into harvest by the second year. Our process is slightly slower than our sod producers. Coming out of winter we were concerned about our zoysia and yes bermuda but it has been the best season in a long time for warm season turf. The tees and fairways have been pretty spectacular since the 4th of July. With our schedule disrupted from weather and mechanical issues, we continue to get our fairways aerated a few each week. #2,3,4,5, and 16 were completed this week which leaves us with 7, 10, 11, and 12 to complete which we plan to finish on Monday. What should have been a two-three day process has been pushed into nearly 4 weeks but the fairways are recovering nicely and will be in great shape for the fall. The middle of August is the latest we want to aerate zoysia so it has enough time to recover before dormancy sets in by late October. The WSJ ran an Article last week regarding the issues many golf courses across the country are facing over the past couple of months. The high heat, rain or lack of rain and humidity has created many problems for turf managers this season. Hopefully, we can see the light at the end of the tunnel, at least average weather would be good. Not only has it been difficult for our staff but attempting to golf in this type of weather has been miserable as well. USGA Mid-Continent Regional Agronomists made a post last week regarding the conditions from Texas to Illinois which covers our region as well. North, south, east, or west, it appears there is trouble everywhere. The microbes that we placed in 10 lake in June are finally doing their work. 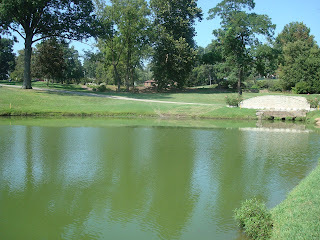 We have not sprayed the lake with any algaecide product in at least 3 weeks even though it has been extremely hot. The algae that is usually seen floating in a 3-5' ring around the edges of the lake is now being controlled by the little bugs that are chewing up the organic matter on the floor of the lake. Without any source of food, the algae will not form. All 19 greens were hydrojecting of our today by E&E Enterprises. 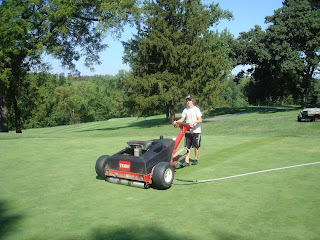 Owner Tom Edgerton and his two teenage sons operated 3 machines that vented our greens in about 4 1/2 hours. Apologies to the 9 hole ladies who played through the last couple of holes as the guys were completing their work. The process will help to reduce compaction, exchange carbon dioxide with oxygen, allow for water penetration and will help to begin the process of drying out our greens from the wet and humid conditions of the past couple of weeks. Their is little if no surface disruption from this process. Check out the link below to see the aerator in action. This process along with our needle-tined operation with our verti-drain should assist our greens with their recovery once the weather breaks over the next few days and weeks. The hydroject pulses high pressured water into the green surface creating a hole that goes about 4-5" deep. Over the past couple of weeks, we have experienced some interesting conditions here at Glen Echo. Heavy rain, high humidity, multiple days with temperatures over 90 degrees, double the normal rainfall do not equate to firm and quick golf greens. We also experienced a much warmer than normal June which encouraged our warm season turf but also created some initial problems for our cool season turf. Our push up greens with 3-5" of soil do not dry out quickly which leads to a putting surface that is soft, puffy, and not in the best of health during high humidity and heat. We are doing everything we can to promote healthy turf in a number of ways on our greens. Raising our height of cut slightly which increases the leaf surface allowing the plant to produce more energy to survive the stress period. Slightly higher mowing heights also reduce some of the scalping which occurs when greens get soft this time of year. As you can see on our greens, there is still some scalping occuring near the edge of some greens. Use smooth rollers instead of the grooved rollers which creates even pressure across the length of the mower. Our grooved rollers push down on the surface of the green and creates additional stress to the turf. Substitute rolling for mowing on an occassion which keeps the plant from being cut which can then give an opening for disease to enter the plant. Rolling does allow us to maintain speed. Needle tining our greens which will help moisture move through the profile either down and or out through evaporation. Compacted greens can provide an environment which encourages the onset of a number of diseases. Handwatering greens only as needed and leave the overhead irrigation shut off to our greens. Applying protective treatments plus light fertilizer and micronutrients to allow the turf to potentially grow out of any damaged and or diseased condition as weather changes to the better. Eliminate cultural practices such as topdressing with sand, verticutting, and excessive grooming which can damage plants and encourage disease. We've had 37 days so far over 90 degrees and it appears that the next 10-12 days could include highs above 90 as well. Normal for St. Louis is around 42 days so it appears we will be way above that for this season. 6.69" of rain for July which is double the amount we normally receive and most of this occurred during the last 10 days of July. As temperatures begin to moderate, especially night temperatures down into the 60's, we will begin the process of speeding up our greens to the normal putting condition that you have come to expect here at Glen Echo. I appreciate your patience during this most difficult period of weather that we are facing at the club.